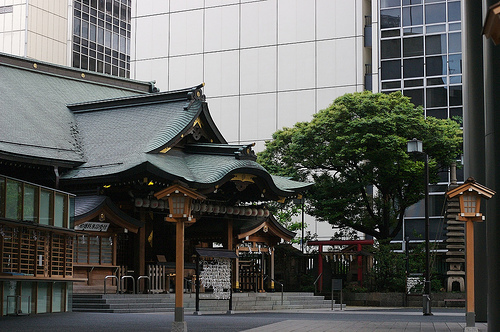 In a business district in Toranomon, Tokyo, there is a shrine which has 350 years history. The wooden traditional shrine, Kotohira-gu stands out against the silver, contemporary buildings. The grey torii (Shrine archway) stands along an office street. 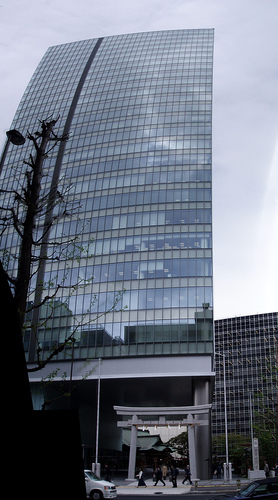 In the precincts, there are kagura hall (god entertainment hall), shrine office, and 9-story office tower, Kotohira tower. The god worshiped at the shrine is called a maritime god. Also the god is renowned for his potency for business, temperance, and abstaining from smoking; therefore, many business men in suits are seen in the precincts. It takes only one minute walk from Toranomon Station (Tokyo Metro Ginza Line) to Kotohira-gu.